Rose tea, also sometimes known as rose bud tea, is made from whole, dehydrated rose blossoms. These delicate pink flowers make a fragrant brew that is light-tasting, fruity and low in calories. In some cases, rose tea is made from whole petals of mature roses, which are also dried and used as the sole ingredient in rose tea. Rose tea can help relieve menstrual cramps and is rich in natural antioxidants. 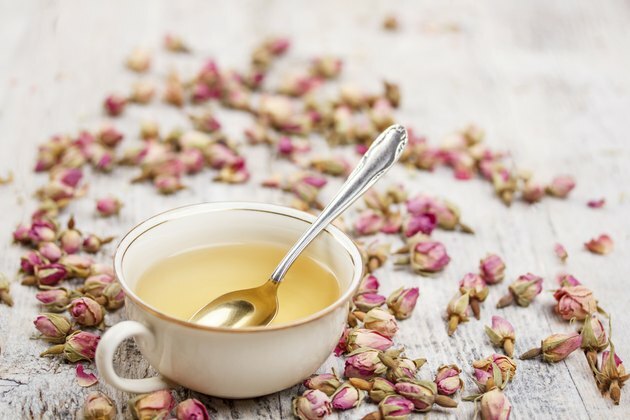 Rose tea can help relieve some of the symptoms of menstruation, namely cramping, according to the 2005 study published in the "Journal of Midwifery and Women's Health." Scientists studying adolescent women in Taiwan found that drinking rose tea over a period of six months led to less cramping during menstruation, as well as relief from the psychological stress associated with cramping during periods. Scientists concluded that drinking rose tea could provide welcome and necessary relief from menstrual pain without any adverse side effects or safety concerns. Rose petals are a natural source of vitamin C, according to a review published in the "Iranian Journal of Basic Medical Sciences." Vitamin C is a natural antioxidant which can block some of the damage that can result from exposure to toxins and free radicals. Such damage can lead to increased rates of aging. Vitamin C also provides support for your immune system, and it aids in the production of collagen, a protein essential for healthy skin and hair. Rose petals are rich in polyphenols, which are water-soluble. A 2007 issue of "Zeitschrift fur Naturforschung" found that rose petals were high in polyphenols as well as a range of other antioxidants, including ellagic acid and quercetin. A 2005 review on polyphenols published in the "American Journal of Clinical Nutrition" discussed the role of polyphenols in helping prevent cardiovascular diseases as well as osteoporosis and possibly even cancer. While polyphenols are recognized for their general health benefits, however, more research is needed before polyphenols can be recommended as a treatment for specific conditions. You can make rose tea from fresh or dried petals. For dried petals, use 1 to 2 teaspoons of leaves for 1 cup of water that has been heated to just before boiling -- 194 to 203 degrees Fahrenheit. Allow the tea to steep for two to three minutes. For rose tea made with fresh petals, use 2 cups of fresh rose petals -- remove the white portion at the base of the petal as it has a bitter taste -- and combine with 3 cups of water. Heat the water and petals at a gentle simmer for five minutes, and then strain. You can sweeten rose tea with some sugar or honey or drink it plain. What Are the Benefits of Witch Hazel & Rose Water?